The anteater is a very strange looking animal but here you can learn more about them. At first glance it almost looks as if it has two tails a large on in the front and a long skinny one in the back. Anteater has long claws which it uses to dig in the dirt for ants and other insects. Its skin is rubbery and hairy, like that of an elephant. It has long claws which it uses to dig into the dirt for its food. Actually however, it has a long skinny tail and a long, fat nose in the front. Its nose could also be called its mouth, since it is a long tube which houses its long sticky tongue. Most anteaters are found in Mexico and Brazil. They are very protected by the governments because they are fast becoming very rare. Anteaters, as their name suggests, like to eat ants, termites and other insects, anteater was insectivores. They dig in the ground for them with their long claws and then catch them up with their long, pink tongues and by sucking them in through their tubular nose. Anteaters live in the woods. They do not have nests or houses, but just territories and they will find a spot to sleep when they are tired. Anteaters, unlike most animals, walk with their claws turned inward, rather than pointed out. They look almost as if they are walking on their knuckles. Anteaters, except for mothers and babies, do not live in groups but by themselves. 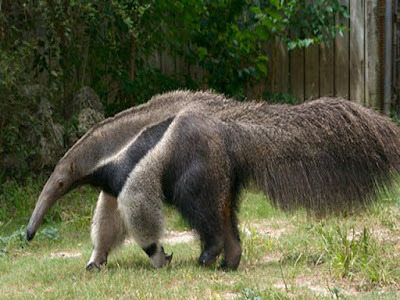 Usually the anteater has only one baby, which it carries around on its back. Anteaters have very low body temperatures. They are one of the coldest animals in the world to touch.